The Web is overrun with dumb hashtags, chart-topping fart apps, and guys just waiting to show you their d*cks. But with this week’s launch of Twitter’s Tailored Trends, Facebook’s App Center, and Airtime’s safety net, some tech companies are fighting back. If you can’t get people to act smarter, at least you can hide their idiocy, and that’s what each of these products does. But can we make the Internet smarter and safer with without whitewashing away differing opinions and locking ourselves in an echochamber? As the the web becomes more mainstream and widely available, it’s expanding from a domain of intellectuals into a dirty mirror of society at large. Unfortunately, the anonymity and abstraction provided by communicating through a screen rather than face-to-face can bring out the worst in people. We type what might never have been said out loud. Sexism, racism, homophobia, and general malice rear their heads when people think there are no consequences. Meanwhile, the urge for distraction from the intensity of life leads us waste time on the shallow and the frivolous. Not only are people downloading FlickABooger and ShakeThatBooty, entrepreneurs are building them instead of dreaming bigger. Thankfully, some of the big tech companies are realizing that broadcasted stupidity makes for a bad user experience. Instead they’re focusing on customized “relevance” that’s relative to who you are and who you’re connected to. If you don’t like what you see, it’s your own fault. Twitter’s re-written Trending Topics algorithm called Tailored Trends is especially clever because it doesn’t directly discourage stupidity, it just funnels it back to people who find dumb things entertaining. Now rather than seeing just the most popular terms and hashtags in your area, you see Trending Topics based on who you follow. So you’ll only see horrible trends like “#UnusualNamesForWhiteGirls” or “#ReplaceBandNamesWithRape” if you follow people that tweet them. 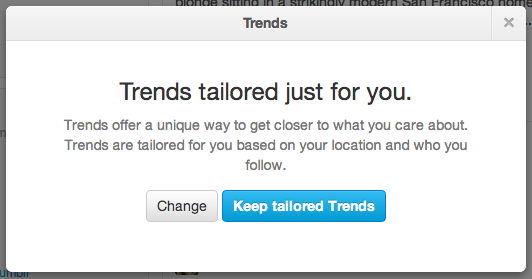 Everyone else will get trending topics that don’t make us embarrassed to be human. Facebook’s taking a similar approach to its new apps marketplace. It recommends apps based on what your friends Like and use rather than the oft-misguided wisdom of the masses like Apple and Google’s app store charts. It also highlights apps based on quality, which is calculated according to true engagement, positive reviews, and the absence of spam reports rather than the number of installs. This editorial philosophy could minimize the spread of pointless, spammy, click-bait apps. Chat Roulette was alternately amazing and awful. You’d meet someone far away and have a real conversation or make each other laugh, and the next person would scream and flash their naughty bits at you. Sean Parker and Shawn Fanning built the solution into Airtime, their new video chat network. When talking with a stranger, Airtime occasionally takes photos of your conversation and runs them through an automated abuse review algorithm to detect for those naughty bits and other disruptions. Users can also flag bad actors. And since Airtime is built on Facebook’s identity platform, it has a one-strike-and-you’re-out policy that really works as trolls have to make a new fake Facebook account and use that. Then they won’t be able to chat with friends, bring their interests and favorite videos along, and Airtime’s credibility matching system will likely pair them with other shady characters that are less fun to prank than the innocent. Some might consider this censorship, and that’s a whole other conversation, but in this case I think it’s warranted to facilitate expression. The big risk of insisting on relevance and safety is that we create a filter bubble where we become isolated from those different from ourselves. Facebook and Twitter need to be especially careful that they don’t completely hide critical Trending Topics or novel apps just because they’re not popular in closed little networks. That might require human input, or an algorithm that recognizes when something’s important enough to show to everyone. The strength of Twitter, Facebook, and Airtime is that they can introduce us to people and information previously out of reach. That’s means bridging the divides, but also quieting the noise.